I've been obsessed with tomatoes this year -- growing them, eating them, and canning them. I canned 30 pounds of organic tomatoes from my local farmers' market using three different methods: raw packed with added liquid, raw packed with no added liquid, and hot packed. I also canned several pints of spicy salsa with 5 pounds of tomatoes and jalapeños from my backyard. It's a great feeling to have summer preserved in a jar and to know that I won't be worrying about BPA leaching into our food through the lining of some aluminum cans. This summer was the first year that I truly tried my hand at growing anything in my backyard. My neighbor helped me plot and plant my herb patch as well as a small vegetable patch. When he saw the number of earthworms in my soil, he was hopeful that the seedlings we were transplanting into a harsh environment might actually flourish. And they did. We ate fresh-off-the-vine tomatoes all summer, but only in small batches. It was only when the weather turned cold that my vines started producing tomatoes like there was no tomorrow. In a way, that was quite true! Frost, combined with a hard freeze over the first weekend of October, signaled the end of summer and, therefore, the end of tomato season. I plucked a large bounty of green tomatoes and knew exactly what I was going to do with them: make Green Tomatoes Bhaji! Bhaji (bhah-gee) has a two-fold meaning, determined by the context in which it is used. It can mean fresh produce or it can mean a side dish made from vegetables. Tomatoes were introduced to the Indian subcontinent by the Portuguese in the sixteenth century. Like peppers, potatoes and other New World vegetables, these were quickly assimilated into the vast breadth of Indian cuisine. 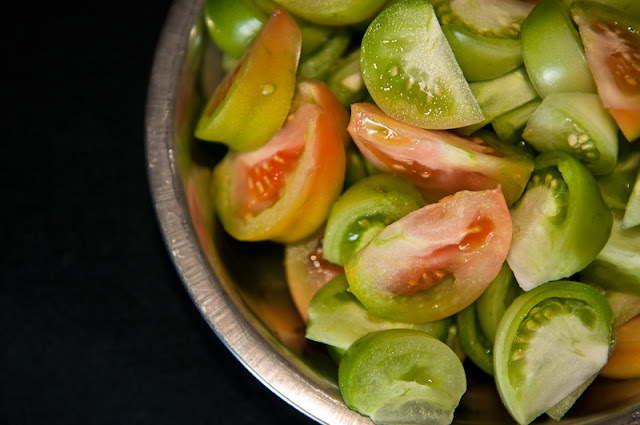 Tomatoes are eaten raw in kachumber or salads, they are used to make the base for sauces and curries, they are used to add a tart flavor to dishes, and they take center stage in soupy, tangy dals. 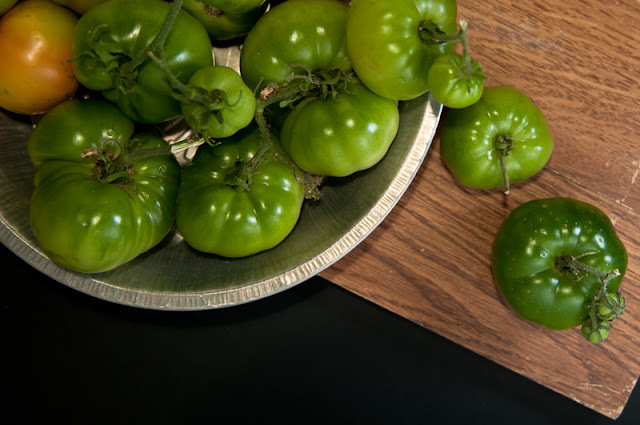 Green tomatoes, however, are not as widely used as ripe tomatoes. Indeed, this tomato bhaji is traditionally made with ripe red tomatoes. It is a fine balance of sweet and sour, leaning more toward sweet. Since I had a fairly large bounty of crisp, green tomatoes, I decided to make a green tomato-based bhaji. Jaggery is the sweetener of choice for most recipes from my home state of Maharashtra, and with good reason. The sugar industry in India is dominated by my home state, with the largest number of co-operatives and factories owned jointly by sugar farmers. Jaggery can be found in Indian grocery stores in large blocks as well as small chunks. It adds a deep caramel flavor to dishes and is definitely worth a try if you have not tasted it before. 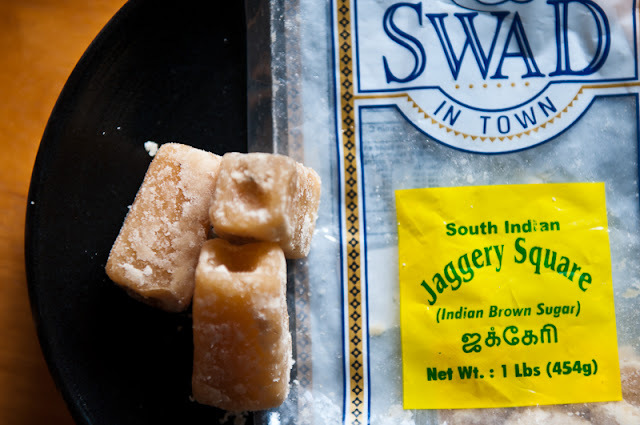 If you don't have access to jaggery, use brown sugar instead. For this particular recipe, I had to increase the amount of jaggery as my green tomatoes were very tart. Green Tomatoes Bhaji packs a lot of flavor for the minimal effort it takes to put it together. According to my teen daughter, "it's a keeper," and I agree with her wholeheartedly. I just wish I did not have to wait until next summer or fall to make it again! You might be luckier than we are here in Colorado, and still have the last vestiges of summer in your area. 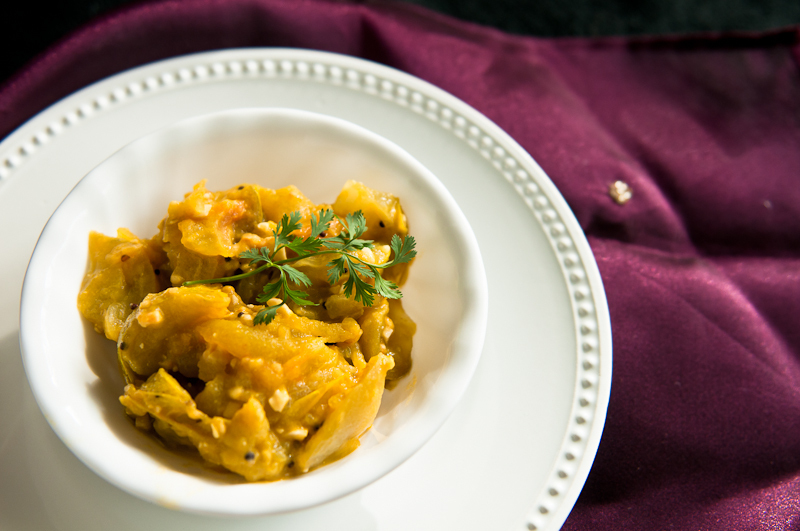 Make the most of those green tomatoes with this bhaji before autumn's cold grip takes over. Wash and slice tomatoes into eighths, or smaller, depending on the size of your tomatoes. In a medium pan, heat ghee on medium flame until it shimmers. Make sure it does not smoke or start to burn. 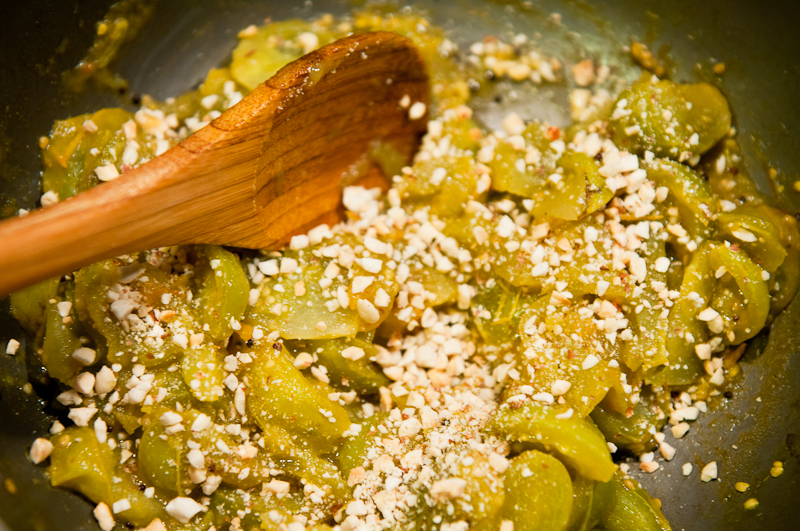 Quickly add mustard seeds, and when they pop, add asafetida, followed by chopped green chiles. Add sliced green tomatoes, jaggery and salt. Stir to coat tomatoes with the seasoned oil and cook covered on medium heat, until tomatoes have softened. About 8-10 minutes. If your tomatoes aren't juicy, you may need to add 1/4 cup water to ensure that they do not stick to the pot or get scorched. Once the tomatoes are tender, add crushed peanuts and mix well. Season with cilantro, if you like, but it's not necessary. Adjust seasonings and serve hot with rotis or as a side with rice and dal. If you don't have jaggery, substitute with brown sugar or coconut sugar. Regular sugar is also fine but you will miss out on the deeper flavor that the other sweeteners lend to the dish. Don't have green tomatoes? Use ripe red tomatoes or tomatillos, if you have any. Preferably, use raw peanuts that you toast yourself on a skillet on the stovetop, or in a microwave, for best flavor. I picked the last of the never-ripening green tomatoes off the vines of my IFR Farm a couple of weeks ago. These have graced our dinner table twice in the last few weeks. First, as part of this simple meal. And, yesterday, as part of an elaborate thali. what a delicious looking thali!